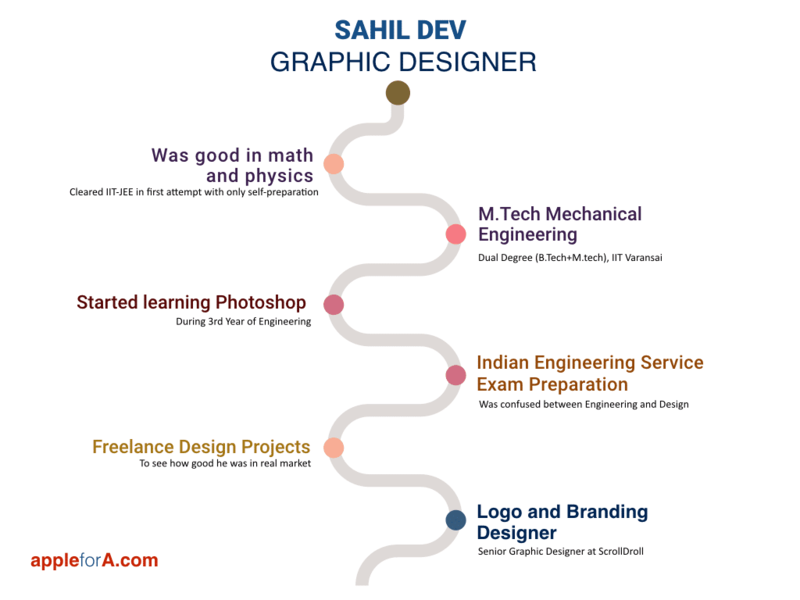 Sahil Dev is currently working with ScrollDroll as Senior Graphic Designer and also work as a freelancer. He is a Mechanical Engineer by education who has completed integrated dual degree (B.Tech + M.Tech) from IIT Varanasi. It did not stop him from following his passion for graphic design and become good at it. Let us hear what he has to say about Graphic Design as a career choice. Who is a Graphic Designer? Anyone who can solve the problems through some visual elements is a graphic designer. It isn’t always about solving problems, sometimes it’s about communication too. What do you do as a Logo Designer and how do you do it? I am a logo and branding designer who create identity for startups and businesses. Other than this I do creative typography and follow a minimal approach for poster design. Ask for the brief. Don’t start work unless you have brief from client because it will save your time. Understand the client business and his/her requirements. Do web mapping where you have to list down all the related keywords related to client’s business. Then select those words which sums up client business completely. Create as many as rough sketches you can think of. Choose the best of them and then try to refine it more. Always remember logo should be as simple as possible because you don’t want to confuse the audience. Don’t add more than 2-3 concepts in a logo. Work on the typography according the logotype. Present it to the client. This job gives me the freedom to express my thoughts very easily. Also, I can communicate with the society/audience without saying a word. Short film about Sahil’s Career Journey. I like to watch science fiction movies. Time travel or psychological movies are my favorites. What did you want to be when you were in higher secondary school? When I was in intermediate I didn’t know what I wanted to be. I finished my intermediate from an underdeveloped city. So you don’t generally get to know about graphic designing or any other non-traditional career options. As I was good in math and physics it was obvious choice to go for IIT-JEE. I got a rank in first attempt only because of self-preparation. What things would you do differently in preparing for this career? I don’t want to go back and change anything. It’s all good. Can you please list the educational programs and training you have been through? I finished my early education from Gyanpur, Bhadohi. After that I did my High School and Intermediate from Dr. Ashok Kumar Smarak Inter College, Akbarpur from U.P Board. Further I pursued Integrated Dual Degree in Mechanical Engineering from IIT (BHU) Varanasi. My School and my college both helped me a lot to improve myself. Till class 7th I was very weak in Math. Later I released that no subject is tough, you just have to study and that’s what I did. I secured one of the top-3 positions in district level, in high school as well as in intermediate. At that time, I was the only student to clear IIT JEE in the first attempt without any preparation. It was kind of a big achievement. I selected Mechanical Engineering as I was good in Math and Physics. But after 2nd or 3rd year I realized I don’t want be a Mechanical Engineer. I started learning Photoshop but wasn’t much into the field of design. Once I graduated I did not want to join a private engineering company. I wasn’t sure about a career in design either. After college I came to Delhi in July 2016 for IES preparation. Same time I also started taking freelance design projects just to see how good I am in the real market. As the response in social media was good, I finally took the decision to pursue designing. Two months later I joined ScrollDroll. What are the challenges you face as a Graphic Designer? It’s all about passion for me. Money and working hours doesn’t matter much. But I don’t like the fact that majority of the people don’t consider this as a respectable profession. What are the skills and education required to be a Graphic Designer? It’s all about creativity and imagination. If you are creative, you can start by learning any tool like Photoshop. You can learn Illustrator too. For formal education you can join NID, CEED or UCEED (IIT’s) or NIFT. However, I don’t think having formal education is a must in this field. What steps did you take to land in your present job? I am doing freelance work and some self-project since last year. On the basis of my portfolio I landed in my present job. What have been the most surprising elements of this career? I got to know graphic designing is one of the toughest job, when I started taking commercial projects. You can’t make money if you don’t deliver quality work. What are your suggestions for an aspiring designer? Design is a very vast field, don’t go for everything logo, illustration, Ui/Ux. First make a good command over one particular field. Software play only a small part in the design. A basic knowledge of color theory, design principles and typography is more important. Find your own unique style. It will help you to stand out in this crowded field. Prefer doing “Free” work on your own terms and condition for the portfolio rather than working on Fiverr type websites. Do some good personal projects to showcase your capabilities. Maintain consistency in your work as well as in your portfolio. If you have 3 best project in your portfolio then don’t add any average kind of project. Process is more important than the final product. Try to show your thought process if you have less projects in your portfolio. Be active on Social media. Visibility is very important if you want to become a freelancer. I chose to be a graphic designer because I like both Art and Science. Graphic Design allows me to explore something creative, where art and science both go hand in hand. What do you think everyone leaving higher secondary school should know? College is the best place to explore yourself. If you are not giving much importance to the subjects taught, you should try out different things during that time. Finally, you can decide yourself what you want to be in future. You can check his Portfolio – DesignerBanda. Thanks for reading!  If you enjoyed this article, leaving your comment below would mean a lot to me and it helps other people see the story. If any of your friend is considering a career in a similar area share this with him/her. You can read more real career stories here.